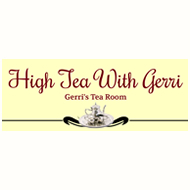 High Tea with Gerri, owned and operated by Gerri herself, uses her years of culinary education, training, and experience in Europe and America to offer a unique and satisfactory experience involving the delicate Art of Afternoon Tea. Gerri hosts a wide variety of events, whether it be small- like birthdays, book clubs, ladies’ socials, or larger events like baby showers and charity parties that can consist up to 200+ people. Even if you can’t make it to Long Grove for High Tea with Gerri, Gerri will bring the High Tea to you; any of these events can take place at any location of your preference. Along with the flexibility in conforming to your specific event’s needs, Gerri guarantees every events originality. Freshly brewed and strained tea poured into Shelly of Worcester antique china tea cups will accompany 8 varieties of sandwiches, scones, apple-rhubarb pie with fresh mint and cream and an array of petite pastries. The originality extends beyond the food; depending on the occasion, you will be provided with many forms of entertainment. An example would be traditional Irish dancers at a St. Patrick’s Day party or a private, professional harp performance for your event. If you want to host an event and you’re uncertain about the theme just call, and Gerri will do her best to make your event a special one. Gerri aims to host events not only for adults but children as well. Although for children, the event is every bit as elegant and unique as an adult event. In a traditional children’s party, Victorian-related games are played, a story of the history of the Afternoon Tea is shared and a short lesson in etiquette is taught. Call and make a reservation today to experience the unique and elegant service only High Tea with Gerri can provide.